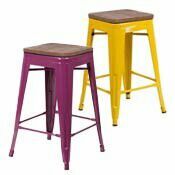 Counter Height Stools are just the right size for vanity tables, kitchen islands and many retail counters. And when your place is where everyone wants to hang out, you’ll want extra stools at the bar in your game room, on the deck and in all your entertainment zones. Indoor-Outdoor Saddle Seat, Swivel and Stackable with Backs and Backless Counter Height Stools made from Wood, Metal, Plastic, Resin and Translucent Acrylic.